Automated System for Customs Data (ASYCUDA) is software used for the automated clearance of goods. 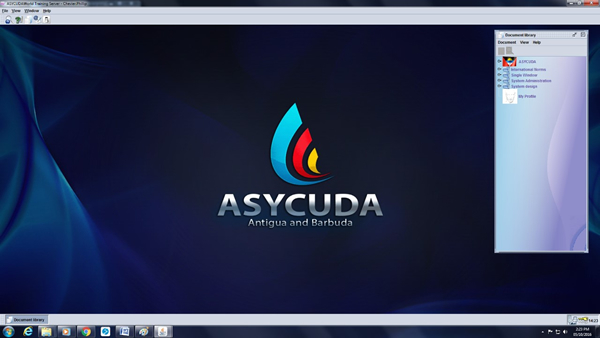 How do I gain access to ASYCUDA? ASYCUDA is internet based and can be accessed using the internet browser, and java technology, additional information on the technical specifications can be found in the technical requirements brochure. Additionally, persons wishing to gain access to the software must register with Customs to do so. Are there any fees associated with the use of ASYCUDA? How to clear my java cache….. The manifest is a transport document that contains all the goods transported by a means of transport during a particular journey via ship cargo and plane cargo. The main purpose of the manifest is to provide the information relating to the transported cargo for commercial or regulatory reasons. A statement, in verbal, written or electronic form, made by the Importer or Exporter indicating the customs procedure to be applied to the goods being imported or exported and providing the information required by the Comptroller. What is a Tax Identification Number (TIN)? What is it used for? All individuals and businesses get a TIN (a 6 digit number) when they register with the Inland Revenue Department. The TIN is unique to each individual and business. How do I obtain a TIN? To obtain a Tax Identification Number (TIN), visit the Inland Revenue Department (IRD) and complete and submit Form F14 “Individual Enterprise Registration” in the case of an individual, or Form F15 “Non-Individual Enterprise Registration” in the case of a corporation or partnership. What are the duties chargeable on goods and how do you calculate them? Customs duties are based on the rates stipulated in the Common External Tariff (CET) and other schedules in force. In general, duty is calculated as a percentage of the customs value although there are some items that attract a specific charge. What are the penalties for false invoicing? The Customs Control and Management Act, 2013 stipulates that there is a fine of $50,000 for false declaration. Tariff classification, rates of duty and taxes, and value for duty. Once you are sure that the goods may be imported, it is your responsibility to determine the tariff classification number, the applicable tariff treatment, the rate of duty and the taxes you will have to pay when you import the goods. All of this information is contained in the Common External Tariff (CET). This document is available for sale at the Government Printery. It is recommended that a Broker be retained to assist with classification. The correct tariff classification number is important as this information helps to paint a true picture of Antigua and Barbuda’s economic situation. Does Compliance mean faster service? We believe that most of our clients voluntarily comply with the law once they understand their obligations and know how to meet them. When you comply with the law, your goods may be subject only to the occasional random examination, which reduces the release time of your goods and in turn, your business costs. Can I use an Agent to make a declaration on my behalf? You may appoint a representative to make an Import/Export declaration on your behalf. If something in the declaration needs an explanation, we will still look to you as the legally declared Importer/Exporter and not the agent for clarification; it is your responsibility as the Importer/Exporter to ensure the accuracy of the information provided on the declaration. We strongly recommend therefore that it is in the best interest of Importers/Exporters to check the accuracy of any Customs Declarations made on their behalf. It is good practice to ensure that you request, receive and obtain copies of all Declarations made to Customs from your Agent on your behalf. When do I need an import license or permit and how soon should I obtain this? When do I need an export license or permit? What is meant by the “origin” of the goods? The place where the goods were produced manufactured or processed. The entitlement to a preferential rate of duty depends on the product meeting its relevant Origin Rule. These rules vary according to the product and the preferential trade agreement concerned. Verify that Item Value total adds up to total in Value Note tab. Verify that the correct Bill of Laden is used. Verify that the number of packages on Bill of Laden matches number of packages used on declaration. If you are clearing all the packages stated on the ASYCUDA waybill you must also clear all the Gross Mass on the Bill of Laden. Ensure that Destination Office on the top right of the declaration matches the Customs Office on the ASYCUDA waybill. Verify manifest Registration Number and Bill of Laden number. Ensure that total items in box 6 of the declaration is the sum of items entered in declaration. Please ensure that weight per unit or number of packages of item in previous declaration matches that of current.